Sarah, Miriam, and Beth—and their abiding friendship—thrive in New York City. Miriam sets sail in Savannah. Beth clings to memories of Rome. The interwoven tales of three women unfold in the voices of Sarah, Miriam, and Beth, whose unshakable friendship takes root in a Buffalo college dorm in the late 1960s. Fueled by the optimism and bravado of that era, they charge into adulthood with high expectations and lofty ideas. They were, as Beth would later observe, "the first generation of women to feel entitled to interesting lives." At times, they find themselves living long distances from each other as each of them seeks new directions and new locales—midtown Manhattan, a Florida suburb, coastal Savannah, the hills of Rome. Nonetheless, they remain deeply connected in the decades after college, sharing their joys and shepherding each other through heartache. With emotional courage and wry humor, they come to terms with a disconcerting postscript to the Age of Aquarius: Life—inevitably, unsparingly, repeatedly—demands compromise. In the year leading up to 9/11, all three women face obstacles on the paths they have long followed. Depending on each other as always, Sarah, Miriam, and Beth confront hard truths about themselves and the choices they have made. They move to dispel past regrets and make peace with present circumstances in order to flourish in the second acts of their lives. 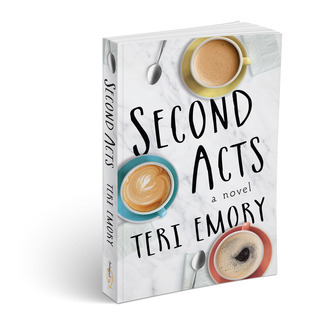 SECOND ACTS is a story of love, loss, and renewal, and a testament to the power of friendship. —To order this book from Amazon, click here. —To order this book from Barnes and Noble, click here. —To order this book from IndieBound, click here.